What strikes you most as you drive from Anapa to Krasnodar, apart from the striking scenic beauty, is the road construction work. Large groups of workers, gathered every few kilometres, are hurriedly widening and resurfacing the highway, for obvious reasons. This is now Russia’s main road to Crimea. Whereas not so long ago Anapa was an afterthought in Krasnodar Territory’s abundance of tourist riches, it’s now on the main road to Crimea from the rest of Russia. Bigger than Sochi, but not nearly as beautiful, Krasnodar does score points for feeling like a “real” city. Sochi is such a massive sprawl (100 kilometers from north to south) that it often feels more akin to a bunch of disparate villages flung together. 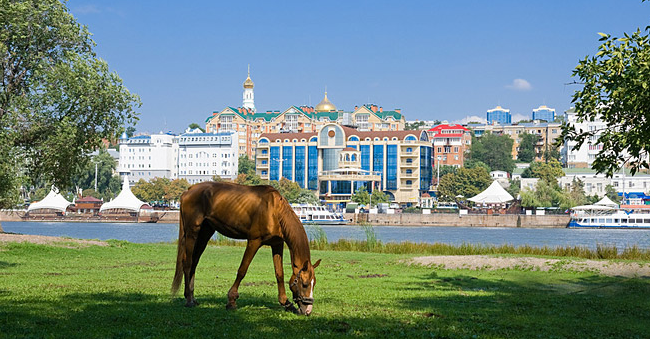 Krasnodar resembles a more traditionally planned Russian metropolis. Economically vibrant and featuring a favorable climate, I’m still not sure how much tourist potential there is here. Founded only 150 years ago (as Yekaterinodar), its historical sights are almost exclusively from the Soviet period, with none of the Tsarist-era attractions of neighboring towns and cities. Close to Krasnodar’s permanent circus, the steel lattice hyperboloid tower, designed by the celebrated engineer Vladimir Shukhov is worth a look. Also a walk down Krasnaya ulitsa is a pleasant activity. It features numerous museums, theaters and restaurants and large parts of it are closed to car traffic on weekends and holidays. The largest splash fountain in Europe is nearby. Entering the town of Krymsk (located about halfway between Anapa and Krasnodar), it’s apparent that you’ve left the subtropical Black Sea coast behind. Unfortunately, Krymsk is currently best known for the tragic events of July 7, 2012 when four months of rain fell in a single day. The torrential downpour caused water to amass in the hilly area outside of town. Eventually it formed torrents that rushed the settlement in tsunami-like waves. The flood killed more than 150 people in the area, with more than 140 people dying in the town of Krymsk alone. After the magnificence of the coastal Black Sea strip, I was somewhat underwhelmed by Krasnodar and quickly moved on to Rostov-on-Don. This was more like it. A large, vibrant city of over a million souls with plenty to offer. Be sure to take a look at Stella, a winged obelisk opposite the Maxim Gorky Academic Drama Theater (Teatralnaya pl. 1). I would also recommend taking a stroll on the delightful Pushkinskaya ul, which is full of places to eat, statues and memorials. One unexpected attraction to be found adorning Rostov’s underground passageways in the center is mosaics dating from the Soviet period. The best one was at Bolshaya Sadovaya ulitsa’s intersection with Pokrovsky Square. This underpass is right in front of Rostov State Musical Theater, which features opera and ballet performances. Culture vultures should take in a performance. Tickets are priced from 400-1,500 Rubles ($7-24) and shows range from Mozart to Swan Lake in an eclectic schedule. Be sure to dress for the occasion as my leather jacket and jeans compared most unfavorably to the local’s enthusiasm for three-piece suits. After all the walking and entertainment, a drink was in order and Frau Muller (ul. Beregovaya 29) offered a wide selection of German beers, with Erdinger priced at 250 rubles ($4.40). I took a room at the four-star Don-Plaza (near the Musical Theater at Bolshaya Sadovaya ul. 115), which included an excellent breakfast at a rate of $75 per night. Being so close (70 kilometers) to Taganrog, I couldn’t resist the temptation to take a detour to Anton Chekhov’s hometown. There I checked out the 188-year-old Taganrog Anton Chekhov Drama Theater (ul. Petrovskaya 90), one of the oldest performance halls in the south of Russia. It was posthumously named for the prince of Russian drama in 1944. There’s also a museum at the house where Chekhov was born (ul. Chekhova 69). The turquoise and white cottage is down a cobbled driveway and an essential visit for literary buffs. After Taganrog came the most boring part of the drive: a trip up the M4 Don Highway to Voronezh. It was a 600-kilometer journey through seemingly never-ending flat plains. Only a few cities - of little interest to tourists - pockmark the route, which runs close to the eastern border with Ukraine. Luckily, the road itself is mostly of an excellent standard. Arriving at Voronezh was a major relief after hours of visual monotony. The residence during Osip Mandelstam's enforced exile from major cities, it's one of Russia’s fastest growing provincial capitals and along with Sochi, Rostov-on-Don and other cities will host matches during the 2018 World Cup. I immediately made for the center via Prospekt Revolyutsii and was taken aback by the sheer volume of monuments along the route. Everyone from poet Ivan Nikitin to Peter the Great to bard and actor Vladimir Vysotsky (on nearby ul. Karla Marksa) seems to be commemorated in Voronezh. You also can’t help but notice the new Annunciation Cathedral, which boasts a cross so massive that I’d be surprised if a larger one exists anywhere in the world (located at Prospekt Revolyutsii 14B). Exhausted from the long drive, I sat down at Garmoshka Cafe, which claims to have been open since 1949 (ul. Karla Marksa 94). I enjoyed the taiga (beef) pelmeni (245 rubles or $4.30) and the house specialty, duck breast (640 rubles or $11.26). The excellent meal was washed down with some homemade “kvass,” a lightly fermented drink made from bread (60 rubles, $1.05).